After joining Etsy in December 2006 and prowling around various sections of the site, like the forums and treasuries, our founder Jessica Burko of Reclaimed to You realized that there were Etsy sellers all over the world and decided that she wanted to meet some based in Boston. Since her background is in art and arts marketing, Jessica thought it would be helpful to gather like-minded local Etsy sellers with the goals of working together to network, market our work, and share knowledge, skills, and experience. Jessica posted several times in the Etsy forums announcing that she would have a get together at her South End studio for anyone who was interested in meeting up. 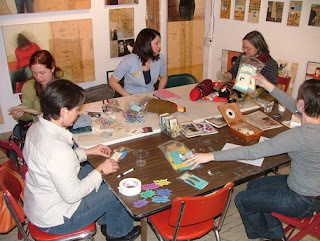 About eight folks came by, we had a work share session, talked about what we might like to get out of an organized artist group, and Boston Handmade was born! 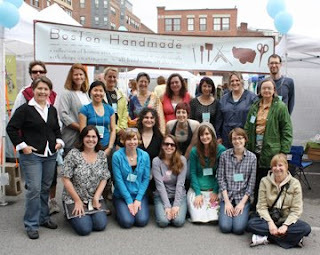 Most of our members stumbled upon Boston Handmade through Etsy’s forums, some through internet searches of the Boston craft scene, but some found us through other avenues. Kerry of Kerry Hawkins Photography learned about Boston Handmade when she met Nancy Rosetta at Nancy’s sister’s frame shop. Kerry has had photos at her sister’s shop Custom Art Framing and Gallery 9 in Norwood for a few years now and would stop in all the time to have mats cut. She got to know Nancy and decided to apply. Jennifer of Majenta Designs heard about us through fellow Boston Handmade-er Jaye of Thirteenth Story when they met at a Culture & Diversity Fair sponsored by a local adoption agency. Jennifer had only gotten into the jewelry-making business a few months prior, and this fair gave her the opportunity to talk with Jaye about all sorts of questions when it comes to being an artist in the area. Jaye was so friendly and helpful with her experiences, and later told her about a group she was a part of, Boston Handmade. Lucie of Lucie Wicker Photography heard about Boston Handmade from her parents who heard about it from Jessica. They had gone to a few of the early Boston Handmade shows and told her it was Boston artists who were on Etsy. Lucie, being a Boston artist on Etsy, thought she’d be a perfect fit and decided to apply. No matter how any of us found Boston Handmade, our reasons for wanting to be a part of the group all basically mirror the reason Jessica started it to begin with. We are so excited Boston Handmade has grown to be the amazing collective it has become and look forward to the years ahead!